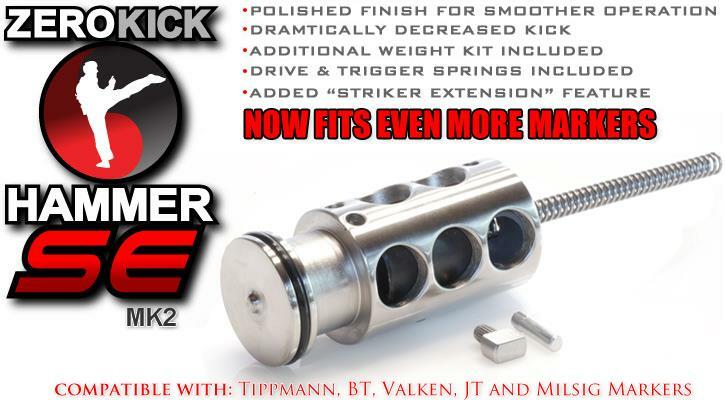 Reduced Weight, Hand Polished, Reduces Kick/Recoil, INCREASES Accuracy and Efficiency! The Zero Kick Hammer SE™ MK2 is the most noticeable performance upgrade you can install on your paintball marker. Zero Kick Hammer Mk2 design is nearly half the weight of the stock hammer and hand polished. These two things combined make for dramatically improved firing characteristics and shot grouping that you can see and feel with every shot. NOT ONLY IS THE ZERO KICK HAMMER LIGHTER AND SMOOTHER, ITS ALSO HARDER THAN THE STOCK HAMMER. THIS MEANS IT WILL LAST LONGER AND STAND UP TO MORE EXTREME CONDITIONS. Simply the best upgrade you can do to your marker! Increased Rates of Fire and Lowers Pressure! Hand Polished to Increase Accuracy!!! 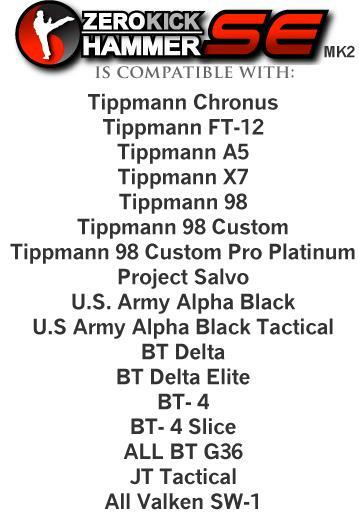 - Tippmann 98, 98 Customs, 98 Custom Pro Platinum, ALL Alpha Blacks, Project Salvos, US Army Guns, A5, X7, FT-12, Chronus. - BT-Delta and BT-Delta Elite and other variation of BT-4, BT-4 Slice, BT-G36. - Valken SW-1, and RM-1 and all variations. It basically works in any gun that is similar to these. Over the years everyone has copied the Tippmann, and so it works in many guns. It's likely that it will fit in even more guns in the future! Comments: Worked first time, trouble free results. You can feel the difference. Everything you need is in the package. Including a few extras. Would recomend to anyone who uses a A5. Comments: It was like a whole new marker. You didn't warn me about that. Now I can't stop smiling . A night and day difference. Simple to install . Thank you engineers !! Keep up the great work! Comments: This is the best upgrade I've done to my tippmann 98! Shoots faster and conserves more air. Customer service is AMAZING also!! If you want your gun to shoot quieter faster and smoother , look no further! Comments: It's like a whole different marker! Thanks! 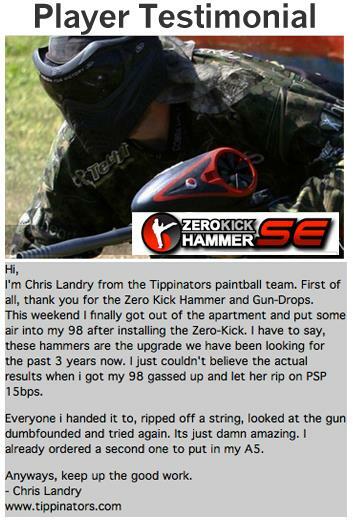 Comments: Like this hammer it makes my tippmann 98 faster, it is a good hammer !!! So if you want a good hammer the zero kick hammer se is the one!